The Terre Nere estate has roughly 20-21 hectares, of which 15 are planted to vines. Roughly 4.5 of these have been uprooted and will be replanted within two years after letting the soil "rest". Two vineyards, for a total of roughly 11-12 hectares, make up the Calderara Cru, of which 1.5 hectares are pre-phylloxera; the rest are about 40-50 years old (and they have not been uprooted). Two different vineyards comprise the Guardiola Cru, for a total of 2.1 hectares, almost all of which is pre-phylloxera (except for some replanted vines). The Guardiola vineyards are the highest-altitude red-grape vineyards in Europe! 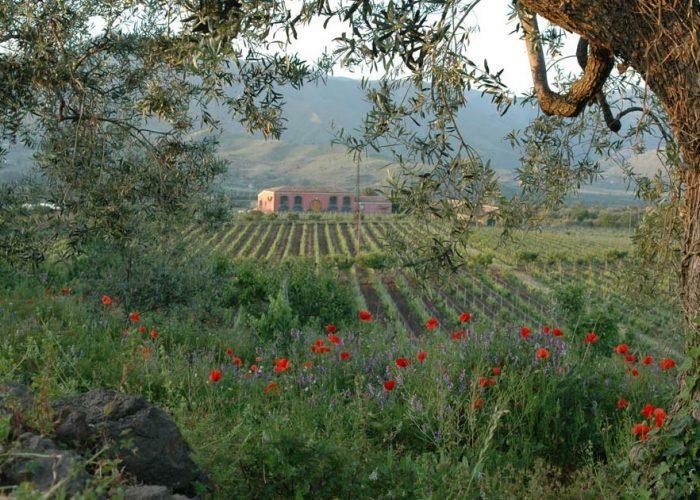 The "Feudo di Mezzo" Cru is made up of two other vineyards, for a total of 1.35 hectares. 500,000 years of volcanic eruptions have created endless soil variation in neighboring plots of land, many of them radical. The soil at Terre Nere is mostly volcanic ash speckled by black pumice and peppered with abundant volcanic rock; to call it 'rocky' is putting it mildly! The weather variations in the area are profound and generally characterized by exposure, altitude, and 'airiness,' defined here as the character of a well-exposed vineyard not protected by hills, and therefore open to the cooling and drying effects of the wind. This is particularly important at Terre Nere because the harvest usually takes place in the last weeks of October, meaning that the grapes are in their most fragile state when the weather 'breaks' its autumn pattern, making them susceptible to oidium and mildew. The 'airiness' of the climate, however, helps to dry out the grapes after rain and moisture threaten mold. The 2004 vintage marks the real birth of Tenuta delle Terre Nere, because for the first time the estate is self sufficient, and the grapes produced were vinified at the estate's new cellars. The wines are astounding. The '02 and '03s have been likened to Pinot and Nebbiolo, as being Burgundian or Langhe-esque. Now there's no doubt about it. The old vines cuvees are difficult to distinguish from very fine Burgundy! With their subtlety and generosity, the wines manage to be rich and precise at the same time.